Grand Knights History will make Western gamers' eyes pop and thumbs ache this winter. Perhaps you've used Vanillaware's Odin Sphere to demonstrate to friends that 2D graphics are not dead at home (I know I have), but there's currently no way to show your friends the latest and greatest in side-scrolling technology when you're on the go. Come Winter, that will all change, thanks to distributor XSEED Games. XSEED plans to bring Grand Knights History, a turn-based RPG with Vanillaware's signature storybook graphics, to Western PSPs in just a few months. Vanillaware developed a strong cult following in the West for titles like Odin Sphere and Muramasa: The Demon Blade. These games combined the best elements of 2.5D side-scrollers and Japanese RPGs, making for engaging but difficult experiences. While Grand Knights History eschews the real-time aspect in favor of turn-based battles, Vanillaware fans should feel right at home. 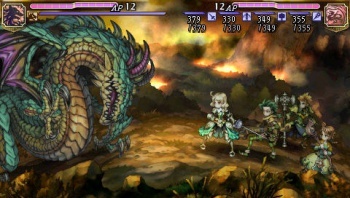 "Vanillaware is renowned for their beautiful and striking hand-drawn 2D graphics, and [its] stunning visuals and strategic gameplay," said XSEED president Jun Iwasaki. "Grand Knights History will be a must-have for all PSP owners with a taste for deep, engrossing RPGs." As Sony preps the Vita for release, it's nice to know that PSP owners will get at least one more quirky cult title before the aging handheld goes quietly into the night. Vita early adopters need not fear, however, as the game will be available via PSN download, making it Vita-ready. European fans should note that Rising Star Games will publish the game in the Old World, although XSEED has not indicated any release date discrepancies. Grand Knights History had rave reviews in Japan, so PSP RPG fans should definitely keep their eyes peeled for more specific details as they emerge.